The fish pictured above may appear quite different from the one below, do not adjust your sets! The fish below however displays the blotchy spots and tail stripe patterning of the juvenile form of this fish. The adult pictured above displays a regular spotted colouration, the brown or grey background colour is constant throughout the fishes development. At one time I kept 5 Synodontis eupterus and was raising them together in an attempt to learn more about their behavior and (hopefully) reproductive habits. Unfortunately around that time I had to make a few difficult decisions about which fish to move to my tanks at work and which to sell. Basically I kept fish that would be hardest to replace for one reason or another. The Featherfins are relatively easy to find and so went on the "for sale" list. On a positive note, I kept these 5 individuals for nearly a year and grew them up from less than 2" to the largest which, when sold, was at least 6" standard length with the magnificent dorsal fin extensions found in this species of Synodontis. I also learned about the social habits of these fish among their own species. 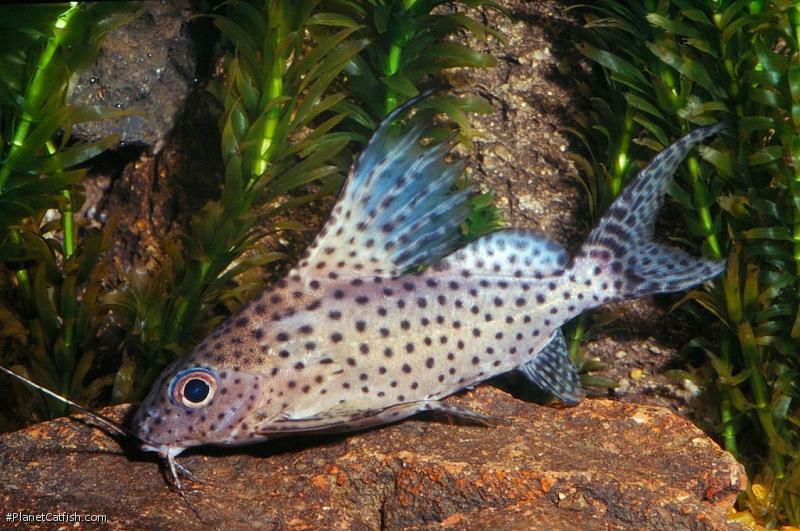 One reason that so few catfish have been bred in the aquarium is people tend to buy individuals and collect as many species as possible rather than collect the same species. Also, many catfish available to the aquarist are too big or territorial to house a number of individual under the same hood. If the care of a rare or new fish is undocumented then it usually makes sense to initially purchase an individual in an attempt to keep it alive and learn about its preferred diet, habitat etc. However with a well known species like Synodontis eupterus, the next stage is surely understanding conspecific interaction and, ultimately, breeding requirements. This seems to be the aproach taken by current day aquarists and has seen many new species of catfish spawnings being recorded and reported. Type Locality Mouth of Lake No, White Nile, Sudan. Etymology Synodontis: From the Greek syn, meaning together, and odontos, meaning tooth; in reference to the closely-spaced lower jaw teeth. This specific epithet literally means beautiful (eu-=beautiful,good) wing (pteron=wing). Size 222mm or 8.7" SL. Find near, nearer or same sized spp. Juvenile colouration is quite different from that of the adult. The change begins when the fish reach about 40mm and gradually continues until they pass the 100mm mark. Furniture Lots of rock caves and bogwood. Likes open spaces to patrol in the twilight / dark. Ensure the fish do not hide near a heater; they can burn themselves which leaves a nasty scar. Compatibility Peaceful. Can be kept singly or in groups given adequate refuge for each individual. A large multi-branched piece of bogwood is ideal. Suggested Tankmates Most medium or large community fish. Although commonly available as such, not a good species for the small community tank. 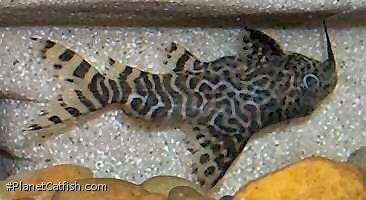 Anything smaller than 3foot / 1 meter long, go for Synodontis nigriventris instead. There are 17 records of this fish being seen, view them all.